Built in the 1960s, on the back of Venezuela’s oil wealth, the bridge spans the inlet to the gigantic Lake Maracaibo. It is the kind of impressive infrastructure project that resource-rich countries like to show off. But as the bridge slopes down to the other side, it leads back to the reality of Venezuela’s economic descent. Cabimas carries a certain mystique in Venezuela. The rush to tap Venezuelan’s thick, sludgy crude began here in 1922, with the launch of Los Barroso oil well. In historic photos, men in ties stand in front of the well, a spray of black gold surging from the ground behind them. Today overgrown grass has invaded the playgrounds of oil worker compounds. Crowds wait outside the bank for their daily limit of cash – normally around 6,000 Bolivares a day, which is less than two US dollars. The oil workers say that the money intended to maintain PDVSA’s equipment ended up elsewhere. They point to the thick layer of polluting oil sludge blanketing the shoreline of evidence of neglect. 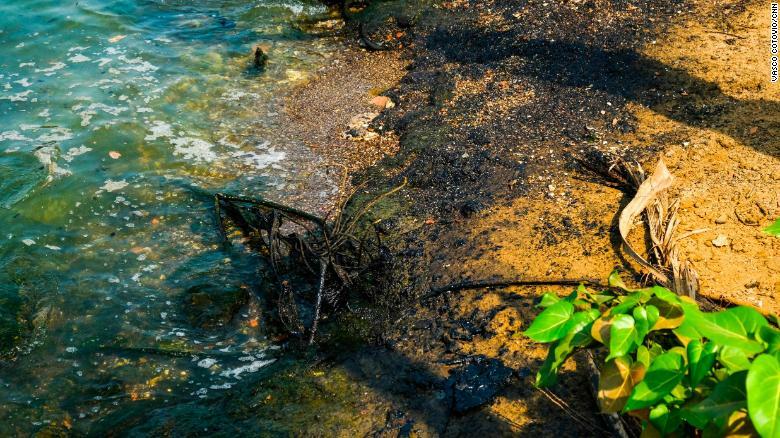 Oil sludge stains the entire coastline of the Maracaibo lake. “This is the reason for the coup. They don’t want us to get better. They sabotage us and try to destroy the economic system,” he said. None of this seemed to matter as much when oil prices were high. Then came what the workers call “the black year”: 2014, when oil prices began plummeting. From about $107 dollars a barrel in June 2014, the price of oil dropped to about $26 a barrel in February 2016. Venezuela’s economy depended on oil. Its declining prices, and the country’s subsequent hyperinflation, hurt both current and former PDVSA employees. All the men agree that they can’t live on their pay in Venezuela. They say their salaries are now worth the equivalent of around seven US dollars a month. “The math just isn’t possible,” one says. A bag of rice costs around 4,900 Bolivares, or just over a dollar at current exchange rates. 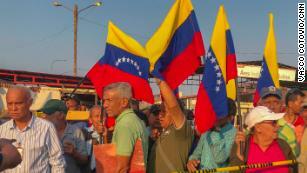 Current and former workers of Venezuelan state oil company PDVSA protest outside of the Las Salinas oil field. “I am crucified because many of my colleagues have died. And we don’t want to suffer the same fate,” he says. After dedicating most of his life to the Venezuelan oil industry, Rodolfo Hernandez says neither he nor his colleagues can afford the medicines they need. 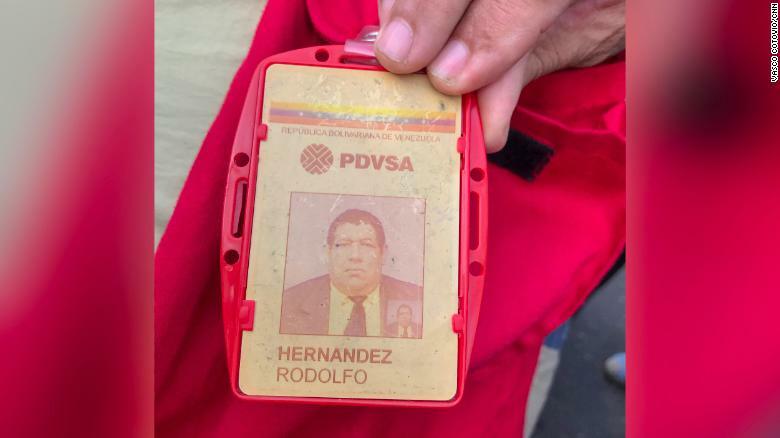 Hernandez isn’t angry at the government running PDVSA; he doesn’t want the government of embattled president Nicolas Maduro to be overthrown. He says he just wants enough money to survive. Enough befitting of a man who helped build this country. Many of the workers seem to share that sentiment. “We aren’t guerillas,” said one. 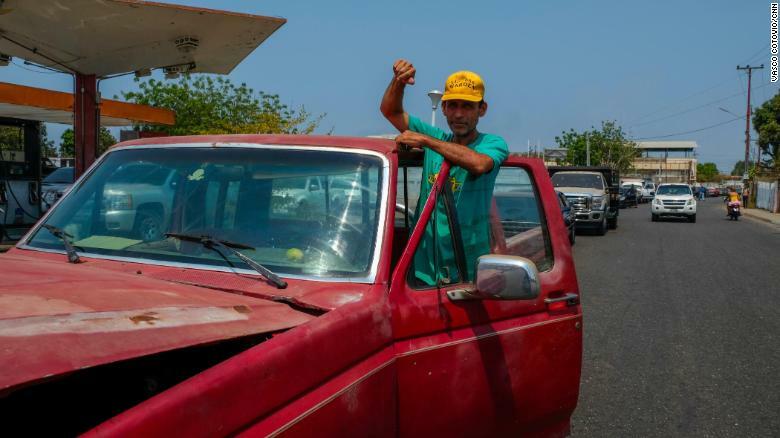 Hinginio Acosta has been pushing his truck through a line of cars, waiting three hours to refill his tank at a gas station in Cabimas. 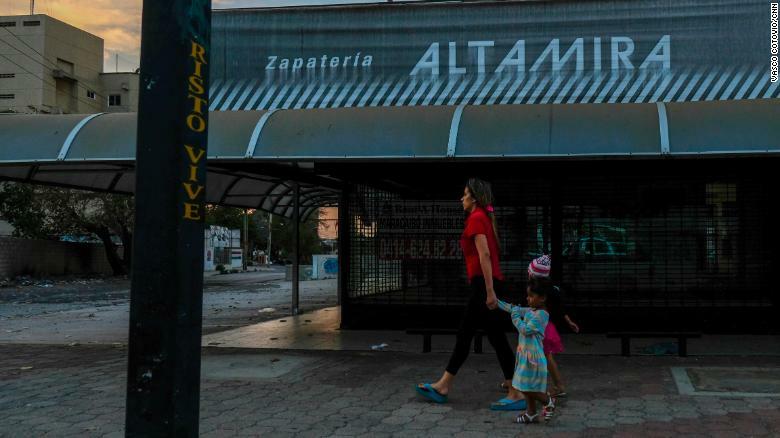 During sporadic nationwide blackouts in March, hundreds of residents in Maracaibo went on a looting spree and destroyed scores of businesses after days of no power. They stayed for two days in the Brisas del Norte hotel – ripping out even the carpets. The hotel managers say nobody from the government has come to see the damage. Once a thriving city, Maracaibo is a shadow of its former self. “Eighty percent of our city’s businesses are now shut,” says Carlos Dickson Barbera, the former head of the chamber of commerce for the state. And as the sun sets, the lights of this once proud city go out, the result of government-imposed energy rationing. As we drive around neighborhoods and business districts, only the flicker of our car’s light break through the shadow. “It is like “The Walking Dead,” he says.